Are you ready for BOTF II? 1. FOCUS ON YOUR SCHOOL. Encourage and direct comments to your team only. Don’t target individuals on the opposing team. Be loud, and be your teams “6th Man”. 3. GET ORGANIZED. Select a group of leaders. Promote the togetherness of the entire student body. Organize theme nights. Develop your own original cheers. Videos should be between 90 seconds and 3 minutes long and each video should contain two components. 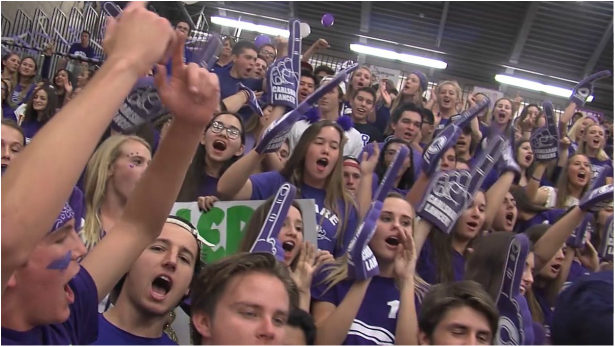 First, you must include at least 30 seconds of a student (or students) explaining how your student section embodies the elements listed in the judging criteria and why your school should be named as the top student section in the CIFSDS section. Second you must include at least 60 seconds of your student section in action. Show us how loud, organized, positive, and original you can be. Don’t forget sportsmanship is a key component to having one of the top student groups in the CIFSDS section. Upload your video to You Tube and then e-mail the link to BOTFcifsds@gmail.com. Videos must be submitted no later than Midnight on January 29, 2017. The CIFSDS section will create a You Tube playlist highlighting all of the videos. After all videos have been posted ( January 29) the CIFSDS section will choose the Top five finalists. At least one Division 4 or 5 schools will be included in the Finalist Group. A member of the CIFSDS section and their appointed representatives will visit all Finalists on a home game night. We’ll shoot and edit our own video to document our experience at your school. We will also meet with the school’s student leaders and write stories about our experiences. The videos and stories can be found on the CIFSDS website and be posted to Facebook for other students to see. The winner will be announced February 21, 2017 and will be invited to the section final on March 4, 2017 to be recognized and receive a championship banner.